NASSCO’s annual “Icebreaker Reception” tradition at WEFTEC 2009 was deemed a great success by organizers. More than 250 gathered for several hours on Oct. 12, to enjoy networking, food, drinks and fun. Millennium Pipeline Company, LLC has announced a binding open season beginning Jan. 25 for shippers seeking firm transportation capacity commencing November 1, 2013 to support system mainline expansions. The Plastics Pipe Institute (PPI) announced an ongoing study by Jana Laboratories confirms 100-plus year life expectancy for pipe made from polyethylene (PE) when used in municipal potable water systems. Projected growth in North American natural gas supplies and market growth in the U.S. and Canada will require billions of dollars of additional investment in pipeline, storage and other midstream infrastructure through 2030, according to a new study released by the INGAA Foundation Inc. In support of belowground installations, the ASCE has recently published MOP No. 118 for Belowground Pipeline Networks for Utility Cables. With the PHMSA in the process of developing guidelines to further clarify baseline and integrity assessment requirements for cased pipe, Mears invited a group of customers to its test-and-research facility for a hands-on workshop of External Corrosion Direct Assessment applications of cased pipes. In spite of a worldwide recession that has affected most areas of construction, members of the Pipe Line Contractors Association (PLCA) were busy throughout 2009, said association President Don W. Thorn. Every year is busy and eventful for the Distribution Contractors Association (DCA), one of the most visible and active trade associations representing the interests of its contractor members in the underground construction industry. The past year has been another busy one for NASSCO – the National Association of Sewer Service Companies – as the association continues to make significant contributions to the storm and sanitary sewer rehabilitation industries. The Denali Alaska Gas Pipeline is a joint venture formed by ConocoPhillips and BP in June 2008 to construct a 2,000 mile long pipeline from the Alaskan North Slope to Alberta, Canada, and if required, a 1,500-mile long pipeline from Alberta to Chicago. 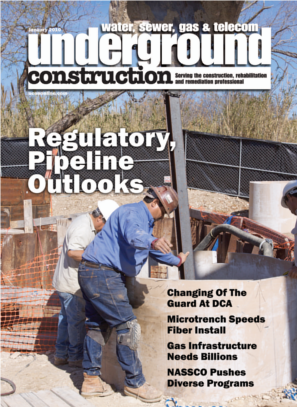 Projected growth in North American natural gas supplies and market growth in the U.S. and Canada will require billions of dollars of additional investment in pipeline, storage and other midstream infrastructure through 2030, according to a new study released by the Interstate Natural Gas Association of America (INGAA) Foundation Inc. When Vermeer introduced the AXIS guided boring system earlier this year, it was presented as a new guided boring system capable of achieving pinpoint, on grade accuracy that eliminates many of the difficult procedures required by other underground installation methods. The American Society of Civil Engineers Pipeline Division recently made major strides into the global market on Oct. 19-21 when it sponsored the first International Conference of Pipeline and Trenchless Technology (ICPTT) at the Regal International East Asia Hotel in Shanghai, China. Like many other communities across the country, Fishers, IN, a suburb of Indianapolis, is in the process of upgrading their aging sewer infrastructure: replacing miles of sewer lines and manholes, and installing new lift stations. By Day 2 of the conference, attendance at the Tampa show had reached approximately 90% of the turnout for the entire 2009 show in UCT’s home state of Texas. Daniel Magill of Avanti demonstrates a number of urethane, latex and gel grouts used for sealing breaches and preventing infiltration in water, sewer and stormwater systems—fast curing and very fun to play with. [inline:rehab zone demo.JPG] LMK demonstrates in the Rehab Zone. [inline:reception.JPG] Early attendees at the networking reception sponsored by TT Technologies, Connectra Fusion and DCI. Several of the exhibitors at UCT this year were new to the show and, in some cases, the industry itself. But new acts in rehabilitation were easy to come by on Day 2. As the second day of UCT 2010 progressed, the mood brightened from wary to relaxed. The opening of UCT 2010’s exhibit hall ushered an impatient crowd over the logo carpeting and into a full-up venue, 125,000 square feet of space studded with heavy equipment and new technology. “Everybody’s always in a good mood at this show,” one longtime exhibitor noted. A beautiful day in Tampa and UCT has kicked off to a promising start. The North American Society for Trenchless Technology (NASTT) has announced a new student scholarship program established in the memory of Michael E. Argent, one of the five founders of NASTT and a motivating force behind the growth of trenchless technology in the United States. CONTECH Construction Products Inc. announced January 12 a price increase for its corrugated metal and PVC products. The price increase will be 8.9% for all corrugated metal products and 9.0% for all PVC pipe products. Two weeks after the new administrator of the federal pipeline safety agency formally took over the agency, PHMSA announced Colorado Interstate Gas (CIG) Company was paying the biggest fine the agency has ever levied under its own authority. New products from Bobcat, GSSI, Spectronics, GF Piping Systems, Volvo and ISCO. The new Case 650L crawler dozer delivers 74 net hp through a Tier 3-certified, four-cylinder, 4.5-liter turbocharged Case Family IV engine with electronic fuel injection for maximum fuel efficiency and easier starts in cold weather. Rain for Rent’s latest innovation in liquid-handling solutions, Freeze Sentry pipe and manifold wraps, prevent water from freezing and maintain a constant temperature to protect equipment and expensive materials. <strong>Work begins on California water supply pipeline </strong> California American Water has begun work on a pipeline in Del Rey Oaks that will help to address water supply issues on the Monterey Peninsula. The Washington Suburban Sanitary Commission (WSSC) kicked off a landmark rehabilitation project Jan. 7, marking the first time WSSC has been awarded federal funding for a reconstruction project through the Maryland Department of the Environment. Over the past few months, I have been asked the same question countless times. With hope in their eyes, industry personnel all are asking for my take on 2010 market prospects. While it is impossible to predict in these uncertain times, here’s an early evaluation. The Association of Equipment Manufacturers (AEM) and Volvo Construction Equipment announced Jan. 11 that they have signed an agreement which makes Volvo the presenting sponsor for AEM's annual Construction Challenge teen competition. The Ultimate Skid Steer Smackdown takes a “D-Tour” with the launch of John Deere’s new D-Series skid steers and compact track loaders (CTLs), including stops at trade shows and real job sites so operators can check out the company’s hottest pieces of compact iron. Underground Tools Inc. has launched an <a href="http://www.undergroundtools.com" target="_blank">interactive Web site</a> with comprehensive information about the company’s wide range of wear parts for the underground construction industry. Advertisers in the print edition of <em>Underground Construction</em>, January 2010, Vol. 65 No. 1. The PR764 Litronic crawler dozer delivers maximum pushing power and ripping force in all speed ranges regardless of the surface. The Case 650L features hydrostatic drive, a comfortable operator compartment, two undercarriage options and superior maintainability. The Volvo PL4608 pipelayer provides a 360-degree working platform. The Caterpillar PL61 Pipelayer provides 40,000 pounds of lift-capacity. The BRON 150P self-propelled Pipelayer features full hydrostatic drive for track speed control and link controls for sensitive hands-on side boom operation. The 700J 12-ton dozer boasts a 115-hp turbocharged six-cylinder Deere diesel, full-featured hydrostatic drivetrain and oscillating undercarriage. Models D85B and D95B crawler dozers offer a hydraulic sideboom option.